We are a modern European airline providing friendly and flexible services based on adherence to safety and high quality using our vast experience and long tradition of a carrier established in 1923. We are one of the five oldest airlines in the world. 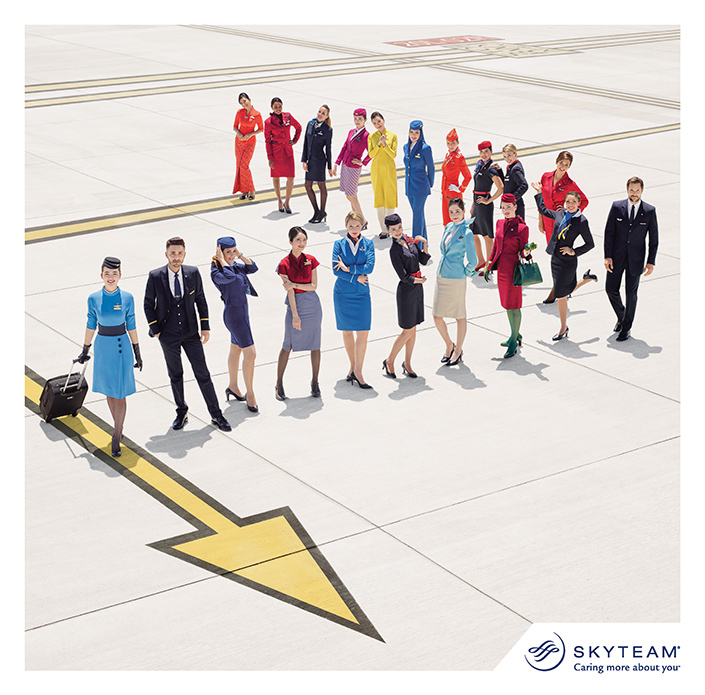 We are a founder member of the International Air Transport Association (IATA) and have been a member of a global alliance of air carriers, the SkyTeam Alliance, since 2001. Company Name: Czech Airlines a. s.
Registered in the Commercial Register administered by the Municipal Court in Prague, Section B, Entry 1662 since 1 August 1992. We specialise in regular passenger air transport, operate special charter flights, leases spare aircraft capacity to other air carriers and offer the air transport of shipments and mail. Czech Airlines has been ISO 14001 (Environmental Management) and IOSA (IATA Operational Safety Audit) certified continuously since 2005. České aerolinie a.s. / Czech Airlines j.s.c., with its registered seat at Prague 6 - Vokovice, Evropská 846/176a, Post Code: 160 00, Company Reg. No. : 45795908, incorporated in the Commercial Register administered by the Municipal Court in Prague, section B, entry 1662, in the role of a controlled entity is a member company of the Group controlled by Smartwings, j.s.c., with its registered seat at Prague 6, K Letišti 1068/30, Post Code 160 08, Company Reg. No. : 25663135, incorporated in the Commercial Register and active in the Czech Republic, as the controlling entity. Additional information regarding the Group is available on the controlling entity’s website: https://www.travelservice.aero/. This notice is published pursuant to Section 79 art. 3 of Act No. 90/2012 Coll., the Business Corporations Act, as amended. Czech Airlines regularly checks and updates information published on its website. Despite the effort, it is possible that certain information changes since the last update. No responsibility or warranty regarding the up-to-date status, correctness and completeness of the presented information can thus be legally enforced. The same rule applies to all internet pages connected with Czech Airlines’ pages by hyperlinks. Czech Airlines is not responsible for the content of thus visited websites. Certain information and offers are provided by Czech Airlines partners as independent services. Please, bear in mind, that the Terms and Conditions enforced by our business partners relate to the above-mentioned services and offers and that no recommendations and warranties may be drawn from the fact that there are links to their websites from Czech Airlines’ website. Czech Airlines is not responsible for the content of its partners’ websites. The suppliers are not representatives of Czech Airlines. Further, Czech Airlines reserves the right to change and amend the provided information at any times. The contents and structure of Czech Airlines’ website is subject to Copyright. It is only possible to duplicate information, data, texts and graphic element content thereto with prior written consent provided by Czech Airlines. The Environmental Management System (EMS) was implemented in our company in 2008, in line with the requirements of the ISO 14001 Certificate. Since then, it has been regularly re-certified by an international company. Our goal is to continue to decrease both the direct and indirect impact of our operation on the environment and to the maximum extent apply the strategy of prevention and the principles of avoiding pollution. We realise that the noise burden connected with aircraft operations is perceived to be a serious issue. However, any noise abatement measures must comply with all safety criteria and reflect the economic reality. In-flight, there are two sources of aircraft noise production, the most prominent being the noise of the propulsion units (motors). Aircraft aerodynamics is the second major source of noise which originates as a natural consequence of airborne motion. With new generation of aircraft, advanced technology has made it possible to significantly reduce noise levels in both components. In the last 20 years, Czech Airlines has fundamentally changed its fleet, replacing the old and obsolete types of aircraft with new machines certified in the lowest noise categories based on international standards. The process of modernization of the fleet continues to this effect. Land-use planning and management is the responsibility of the airport administrator and operator. Even if all restrictions are met, aircraft operations produce noise which results in a specific protocol applied in the airport surrounding areas. The airport operator, Prague Airport, joint stock company, follows the issue closely on its website. Operational restrictions/bans are applied as restrictive measures to prevent excessive noise from aircraft operations over noise-sensitive sites (e.g. hospitals) and at noise-sensitive times (e.g. at night). Details of these restrictions are published in the Flight Information Manual and may only be violated in cases where flight safety would be compromised. The office of the Air Navigation Services of the Czech Republic informs about the air traffic management system activities on its website. The departure (SID – the Standard Instrument Departure Route) and arrival (STAR – the Standard Terminal Arrival) procedures are the most important noise abatement measures applied in the vicinity of airports, designed and enforced by the airport operator in co‑operation with the key aircraft operator and the provider of air navigation services. The procedures are approved by the Civil Aviation Authority. Czech Airlines is involved in the process of creation of the procedures for the Prague/Ruzyně airport. The resulting departure and arrival procedures are then published in the Flight Information Manual and must be adhered to by pilots. The adequacy of procedures for reducing noise burdens depends on the physical characteristics of the airport and its surroundings. In all cases, procedures are selected in a way to ensure the protection of the noise‑sensitive areas near the airport upon adherence to flight safety. Aircraft take-off procedures are selected based on the specification which part of the take-off should be noise-reduced. This dictates the use of the (maximum) take-off power of the propulsion systems (motors) and the wing take-off configuration. If the maximum available power is used, a sufficient altitude is quickly reached and the more remote surrounding areas are better protected against noise. If the close surroundings of the airport are to be protected against excessive noise, procedures with faster aircraft acceleration are applied to ensure the take-off may sooner continue upon the use of less power. To reduce the noise burden during landing, continuous descent is used without changing the speed and power of the propulsion systems. The goal is to ensure uninterrupted descent upon reduced performance and resistance so that the landing gear set can be ejected as late as possible. The adherence to the noise abatement measures is closely monitored on both SID and STAR routes. Aircraft crews always priorities traffic safety when making decisions. There are cases where it is necessary to deviate from the prescribed procedures for maintaining flight safety – e.g. conflicting traffic, rain storm, etc. Czech Airlines pilots undergo continued training with due attention paid to noise abatement procedures. Noise levels from aircraft operations at the Prague/Ruzyně airport are regulated by the airport operator – Prague Airport, joint stock company. Czech Airlines, just as other air carriers, pays noise charges for every landing at the Prague/Ruzyně airport. The amount charged is based on the maximum take-off weight of the aircraft and its appropriate noise category classification according to the noise certificate issued by ICAO (the International Civil Aviation Organization). Prague Airport is responsible for noise abatement measures within the Prague/Ruzyně airport’s Noise Protected Zone. To finance the measures, the airport uses noise charge funds. Czech Airlines is the major contributor to the fund thanks to its almost half share of airport operations a year. Czech Airlines pays dozens of millions of Czech crowns in noise charges a year. Five aircraft noise categories are recognised by the Prague/Ruzyně airport, with Category 1 being the quietest and Category 5 being the noisiest. Aviation emissions currently account for about three percent of total EU greenhouse gas emissions, but their share keeps growing rapidly. Since 2009, Czech Airlines has been included in the EU ETS – the European Union Emission Trading Scheme. The EU ETS is the first of the European Union's mechanisms to ensure the compliance with Kyoto commitments, in which the contracting parties undertook to reduce their greenhouse gas emissions. Originally, only stationary sources of air pollution (power stations, heating plants, large boiler rooms, etc.) were included in the system. Since 2012, the system is also fully applicable to air transport. The purpose of the Emissions Trading Scheme is to reduce greenhouse gas emissions. The Emissions Trading Scheme for aviation at the EU level is subject to the European Parliament and Council Directive No. 2008/101/EC (hereinafter referred to as “the Directive"), based on which the EU ETS system has been extended to include the civil aviation sector as of 2012. The Directive has been incorporated in the Czech legal system by Act No. 383/2012, Coll., as amended. Simply put, every carrier originating or terminating its flight within the EU (plus Iceland, Lichtenstein and Norway) territory will have to secure for each of its flights the respective number of permits to compensate the produced CO2 emissions during the flight. Operators of aircraft included in the EU ETS are obliged to monitor and report on a yearly basis CO2 emissions produced during each calendar year. In detail Emission and Tonne-Kilometre Monitoring Plan, officially approved by the Ministry of Environment, is a necessary prerequisite for the process of monitoring and reporting CO2 emissions or tonne-kilometres. Tonne‑kilometre data is monitored and reported only for the purpose of applying for the free allocation of emission allowances for the trading period or for the allocation of free allowances from the special reserve. Czech Airlines monitors emissions produced during individual flights and evaluates the recorded trends based on aircraft load and other relevant factors. The amount of emissions produced during a particular flight depends on the type of aircraft engine, its age, load factor, selected route, current weather conditions and other factors. At present, Czech Airlines does not produce any technological waste water. Sewage wastewater from regular operations is disposed of using the sewage system on site at the company headquarters. The management of waste generated by Czech Airlines activities is in line with the related legislation, as confirmed by regular inspections by public authorities. The production of individual types of waste is constantly monitored with the aim to continue reducing the amount of hazardous waste production in particular. We pay close attention to prioritizing the use of waste over its disposal. Sorting waste enables us to efficiently recycle the respective collected materials (paper, glass, thin-walled aluminium, various types of plastics, metals, wood) and at the same time ensures certain economic benefits. De-icing agents are used to remove and prevent ice on aircraft before take‑off. Two types of de-icing agents are used on our aircraft: the former designed to de-ice the aircraft, the latter to prevent the frost on aircraft (the layer sticks to the aircraft due to the special structure of the polymers it contains). Aircraft de-icing is outsourced by Czech Airlines and supplied by individual handling companies.